Main memory : 由兩個bank組成,每個bank各有4個16Kbytes Sector、1個64Kbytes Sector及7個128Kbytes Sector，一共2048Kbytes(2Mbytes). System memory : bootloader code 放置的地方，30Kbytes. Option byte : 用來設定讀寫保護、電壓level、軟硬體看門狗與Standby or Stop模式下的重置，每個bank各一個，共32(16+16)bytes. 再透過寫入RCC_CFGR(Reset and Clock Control Configuration Register)中的SW(System clock switch) bits來修改 CPU clock source. 如果需要，可透過寫入RCC_CFGR register中的HPRE(AHB Prescaler) bits來修改CPU clock prescaler以調整clock freqency. 透過寫入RCC_CFGR(Reset and Clock Control Configuration Register)中的SW(System clock switch) bits來修改 CPU clock source. 任何來自D-Bus的讀取會使RDERR(Proprietary readout protection error) flag被設立. read/write (rw) :Software can read and write to these bits. read-only (r) :Software can only read these bits. write-only (w) :Software can only write to this bit. Reading the bit returns the reset value. read/clear (rc_w1) :Software can read as well as clear this bit by writing 1. Writing ‘0’ has no effect on the bit value. read/clear (rc_w0) :Software can read as well as clear this bit by writing 0. Writing ‘1’ has no effect on the bit value. read/set (rs) :Software can read as well as set this bit. Writing ‘0’ has no effect on the bit value. Bit 10 DCEN : Data cache enable. 0: disabled; 1: enabled. Bit 9 ICEN : Instruction cache enable. 0: disabled; 1: enabled. Bits 31:17 Reserved, must be kept cleared. Bits 15:9 Reserved, must be kept cleared. Bits 3:2 Reserved, must be kept cleared. used to configure and start Flash memory operations. Bit 25 ERRIE: Error interrupt enable. 0: Disabled; 1: Enabled. 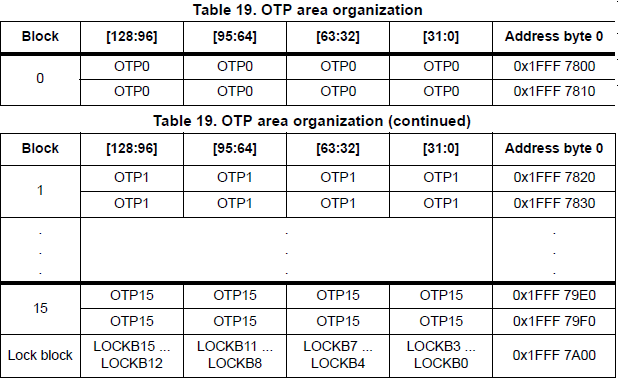 Bit 24 EOPIE: End of operation interrupt enable. 0: Disabled; 1: Enabled. Bits 9:8 PSIZE: Program size. These bits select the program parallelism. Bits 7:3 SNB: Sector number. These bits select the sector to erase. Bit 2 MER: Mass Erase. Bit 1 SER: Sector Erase. modify the user option bytes. 0: PCROP disabled. nWPRi bits used for Write protection on sector i. 1: 1 Mbyte dual bank Flash memory. Bits 27:16 nWRP: Not write protect. 0: write protection active; 1: write protection not active. Bits 15:8 RDP: Read protect. 0xAA : Level 0, read protection not active; 0xCC : Level 2, chip read protection active; Others : Level 1, read - protection of memories active. Bits 3:2 BOR_Level: BOR reset level. Bit 1 OPTSTRT: Option start. Bit 0 OPTLOCK: Option lock. available only on STM32F42xxx and STM32F43xxx. Bits 31:28 Reserved, must be kept cleared. Bits 15:0 Reserved, must be kept cleared.